This Highpoint, located about 15 miles northwest of Charlottetown, is reminiscent of Hoosier High Point in Indiana. From Charlottetown, travel northwest on Highway 216 miles to Fredericton, 2 miles south on Highway 264, then left about ½ mile on dirt road. 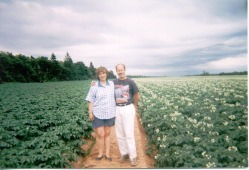 The Highpoint is located about 100 yards south in a potato field. A recent survey has reportedly determined that the highest point is just inside the woods adjacent to the potato field. As with Indiana, this “summit” may seem insignificant, but to a true Highpointer, no Highpoint is unimportant.